A cutaway of the ship showing the thirteen decks. The vessel leaving the Mediterranean port of Palma. The ship on the high seas. 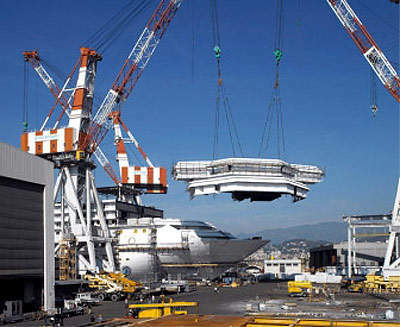 Installation of the bridge at the shipyard in Genoa. ‘Funnel’ installation at the shipyard. The ship bow end just prior to the launching ceremony. The Costa Concordia is the first of the cruise line’s ‘Concordia-class’, which will become their largest operating cruise ships and in fact Italy’s largest cruise ships (the 112,000 gross ton Concordia is the new fleet flagship). The ship was designed for all year round cruising in the Mediterranean with a capacity of 3,780 (1,502 cabins) served by 1,100 crew members. The ship, which was launched from the Fincantieri Sestri Ponente shipyard in Genoa in December 2005 entered service in June 2006 (registered in Genoa). The hull was built on a progression of the Carnival Conquest platform with the interior including features which are unique to Costa. The ship has a length of 950ft (290m) with a beam of 118ft and can make 20 knots if required. The name of the ship ‘Concordia’ is intended to express the wish for continuing harmony, unity and peace between European nations. The ship’s 13 decks are named after European countries (Olanda, Svezia, Belgio, Grecia, Italia, Gran Bretagna, Irlanda, Portogallo, Francia, Germania, Spagna, Austria and Polonia) and as a further gesture towards European integration and unity the interior decor of the rooms on each of the decks reflects its nationality. The Concordia’s maiden cruise departed from Civitavecchia on 14 July 2006 on a nine day itinerary and called at Savona, Barcelona, Alicante, Gibraltar, Lisbon, Cadiz and Malaga before returning to Civitavecchia on 23 July. The ship is now conducting seven day Mediterranean cruises. The Costa Concordia was commissioned in January 2004 from Fincantieri with an order worth €450m. In all, the orders for new build ships placed with Fincantieri by Costa from 2000 to 2004 amounted to an investment of around €2bn. The basic hull of the ship was launched in December 2005 in Genoa and then completed fitting in dock by May 2006. Following extensive sea trials in June 2006 the ship was than handed over to Costa Cruises in July 2006. Pier Luigi Foschi, Chairman and Chief Executive Officer of Costa Crociere S.p.A, the owner of the new ship, said at the launching ceremony in December 2005: “The launch of a new ship is always a very exciting moment for us and once again it is taking place in Genoa, the city where our company is based and where we have built our most recent flagships. 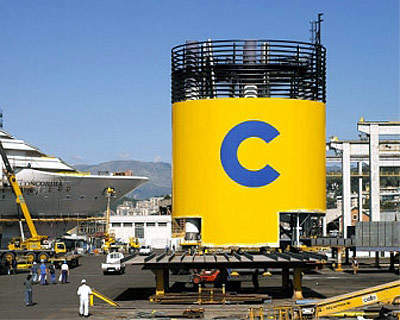 Giuseppe Bono, Chief Executive Officer of Fincantieri said: “The launch of Costa Concordia is a key step in the important new building programme which Costa Crociere has entrusted to Fincantieri in recent years and which has been wholly assigned to Sestri Ponente shipyard. The Concordia’s sister ship Costa Serena is currently under construction at the Sestri Ponente shipyard and will enter service in May 2007. The design of the Concordia has made it one of the most luxurious cruise ships in the world. The fittings are of top quality and the decor is second to none. The ship has four swimming pools (each with a volume of 60m³), two of which will have a retractable roof and one with an 18m² outdoor video screen. 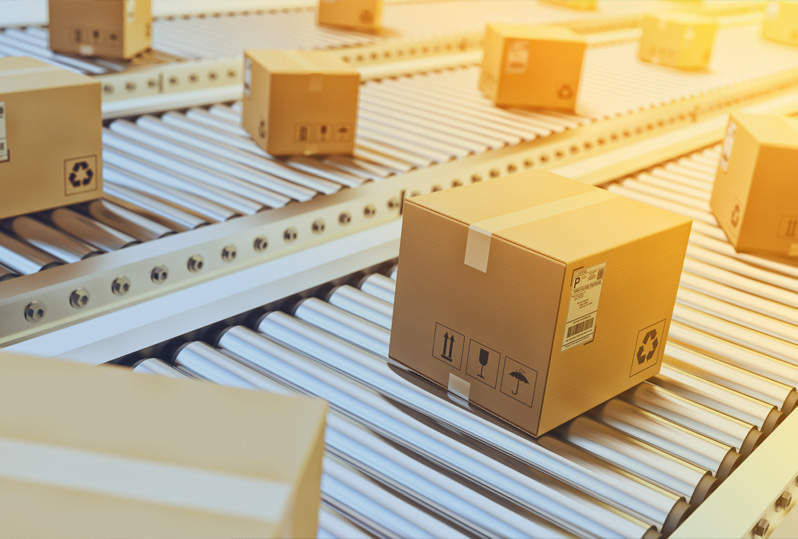 The vessel also has the latest technical innovations such as state-of-the-art telecommunications capabilities (including cell phone connectivity across the globe for passenger convenience). Over 60% of the 1,500 staterooms have an ocean view, which is a high proportion of outside cabins (571 – 38% – have balconies). One of the main innovations onboard is the ‘Samsara Spa’, a 1,900m² (20,450ft²) wellness/fitness centre that extends over two decks and is the largest spa facility of its kind ever built on a passenger ship. 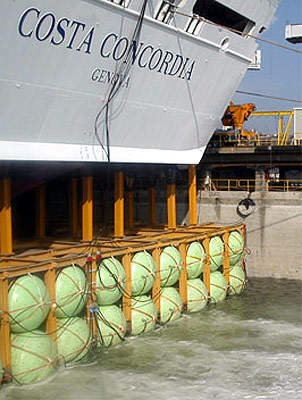 This effectively turns the Concordia into the world’s largest floating spa resort. The Samsara Spa is fitted with thermal baths, a pool for thalassotherapy, a tea house, treatment rooms, a gym, hot tubs, a sauna and a Turkish bath with a swimming pool in its centre. The spa will also offer a mud treatment based on an ancient Middle Eastern ritual where clay and steam are used to nourish skin. The spa has its own restaurant and menu. The 12 adjacent luxurious Samsara Suites and 55 other cabins have direct access to the Spa. Guests who take Samsara Suites or cabins automatically receive a package of treatments which will include an invitation to a tea ceremony, personal health and fitness consultation, two meditation or fitness lessons, two treatments of choice and two solarium visits. In addition there are five open-air Jacuzzis, a beauty salon, multipurpose sports court (basketball, volleyball, tennis) and a whole host of other fitness-related activities. The Europa Atrium – which forms the centrepiece of the ship – is nine storeys high and has panoramic lifts giving views across the whole of the main shopping and entertainment areas of the ship. There are five restaurants including three main dining venues (Samsara, Roma, Milano), one buffet restaurant (Parigi) and an alternative, less formal dining venue, the Club Concordia. The ship has 13 themed bars and lounges. There is also the Casino Barcellona, the Vienna Ballroom, the Lisbona Discothèque, the Athens Theatre, a library, an internet centre and the Costa’s Squok Club children’s facilities with a dedicated pool and video game room. Best of all is the Formula 1 driving simulator, which gives a realistic driving experience at all of the world’s Formula One tracks in a choice of cars. 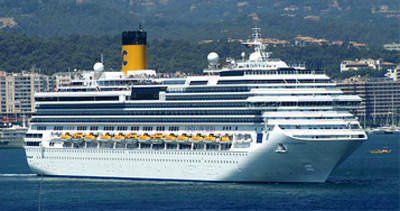 Costa Cruises or Costa Crociere SpA. is an Italian subsidiary of one of the world’s largest cruise operators, Carnival Corporation. Costa operates with two distinct brands, AIDA Cruises and Costa Crociere, which have a total of 15 ships in service and five under construction. All of the vessels fly the Italian flag and are deployed in the Mediterranean, Northern Europe, the Caribbean and South America.